This entry was posted on Wednesday, August 12th, 2009 at 12:40 am	and is filed under commuter rail, railfanning. You can follow any responses to this entry through the RSS 2.0 feed. You can leave a response, or trackback from your own site. That’s great, but football fans on the whole are a dumb bunch, and this will be too confusing for them to figure out. Most will still drive. You are right and you are wrong. You’re right that most will still drive. Duh. The train service can only handle about 10,000 people. If 40,000 or 60,000 or 80,000 show up for a game, then the majority HAVE to drive. So you’re obviously wrong about the reason why. It’s not because they are dumb. In fact, they are pretty smart. Thousands of them already use the Route 351 bus from the Port Authority Bus Terminal. The addition of the rail service will only increase the overall public transit market share. 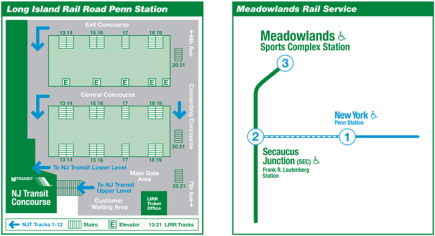 Is there a map that shows precisely where the new Meadowlands train station is relative to the current stadium? It seems much further a walk, but it’s hard to tell. I have respiratory problems, and the bus that leaves you near Gate D might be better for me, but I can’t tell because the maps I found are too general. That graphic is accurate. It is VERY close to the old stadium as well. Like a 1 minute walk. 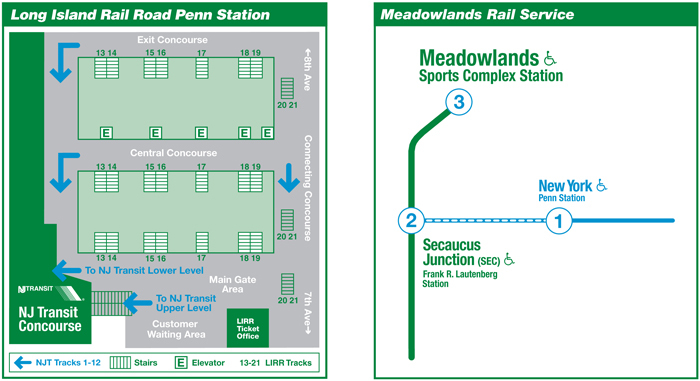 The bus from the Port Authority Bus Terminal no longer leaves you near Gate D. It leaves you further away. About twice as far away. The train station is much closer.